Thank you to everyone who stopped by and visited me! Yesterday I had a fabulous demo down at the University of Oregon Bookstore. I spoke to lots of great students and professional artists from around the community. During the event, I also had a chance to color a beautiful Tracing Memories illustration of the oldest building on campus, Deady Hall. Here is an outline of my process. 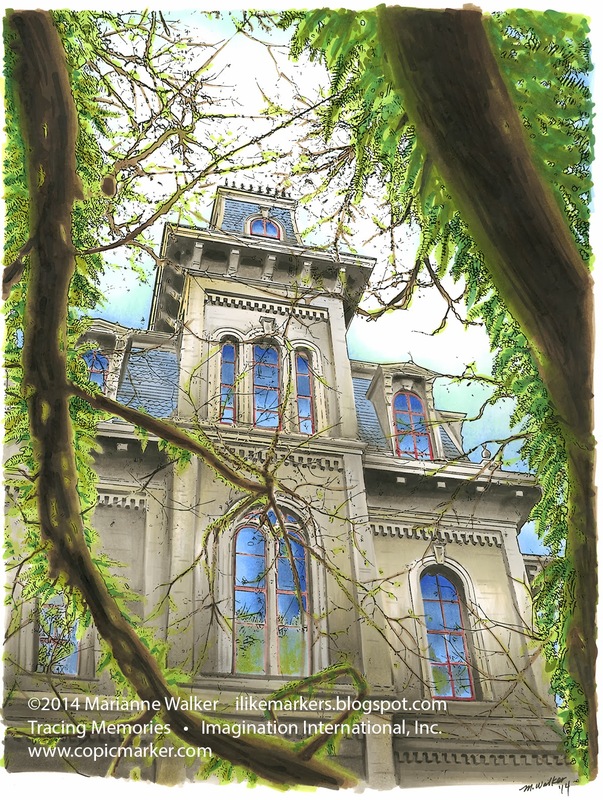 I've known for a few months that I would be demoing at the U of O bookstore, but only a week or so ago had I decided what I really wanted to color....an old building from campus. Last Friday it was actually sunny, so my family and I went for a walk around the U of O campus and took some photographs of a few neat places. 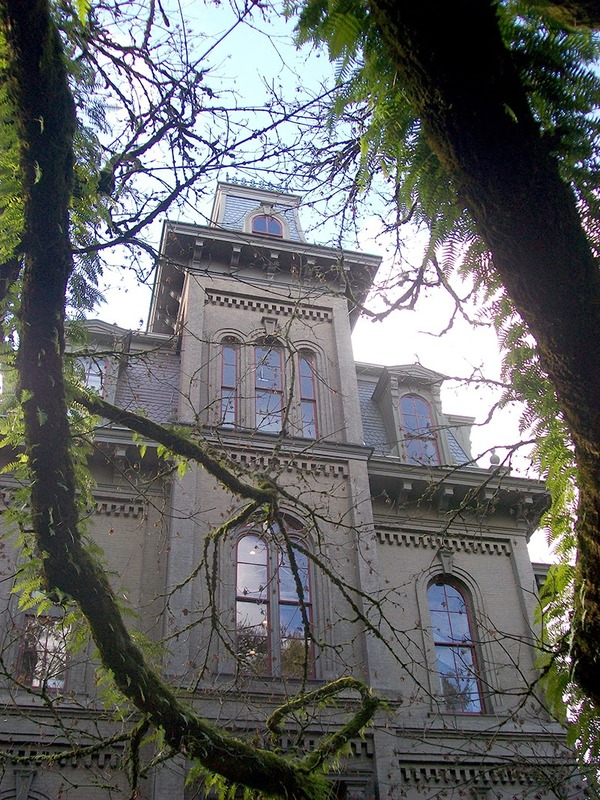 This shot of Deady hall, through the mossy, fern-covered branches really stood out to me. I like this photo because it has good contrast and an interesting composition. As soon as I saw it, I knew I wanted to color it, but to draw it would take hours. So, Thursday morning just before I went to the demo I converted it to outlines on the computer and printed it large, as I would be coloring in front of many people. This picture is about 11x14"
Usually I suggest that people should keep their images smaller to have better success coloring large areas. This image has so many details that it was actually much easier to color it large. I blocked in the building with W1 and the trees with E44. These are not the darkest colors I see in those areas, rather, these are the lightest tones, and I will build up darkness and shadows from there. I avoided complicated areas, like the bottom left corner, as I hadn't decided which shade of gray to use as a base there yet. Next, I worked on the building itself, slowly darkening shadows with a full range of warm grays, and picked out the blue windows with B26, B34, B32, and E04 for the frames. I felt the warm gray was a little too bland, so I threw in YG91 and Y21 in the highlight areas. This shifts it to more of a warmer feeling building, even though the photo was taken in the evening and has a cooler tone to it. I began darkening the first branch with E29, W7, W9, E49 and the greens are YG13, G28, and G99. Look at how the dark contrast on the branches really helps pick out the foliage. The image really begins to pop out with the addition of darkest dark colors and adding subtle tones into the light areas. Here is the color-corrected scan of the final artwork. I love how it came out! This took 6 hrs to color. Each time I look at it, I think of the math class I took in this building while I was a student, or sitting in the courtyard in front of this building feeding squirrels while I was supposed to be drawing things. I also think of the walk with my family on Friday, and the fun times I had yesterday coloring the image. This really holds a lot of special meaning for me, and part of why I love the Tracing Memories program. Needless to say, people loved the demo! I will be teaching even more workshops and demos in the future, so be looking for them. Meanwhile, if you want to take a class in your area, you might be in luck!! I still have a few openings in my upcoming classes in San Diego and Pittsburgh, so visit our website to register or get more information. We currently have over 20 different classes and workshops open, so take a moment and look around our site for something near you. Rarely do I go back and repeat myself, but I figured it's been a few years since I have done a beginner post on simple blending in a circle. The world around us is not flat, and to make things appear more interesting, we should try to color in dynamic ways that make objects appear rounded. Today I will step you through a few different ways to blend a circle to make it look rounded. 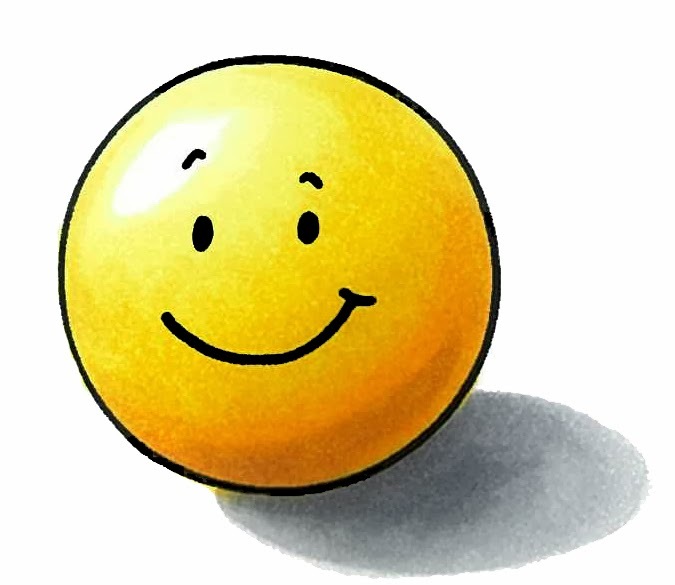 To make a simple smiley face appear round, we will need two or three colors in the same color family. In this case, I am working with a Y11, Y15 and Y38 Sketch marker. Sketch markers are our bestselling product, due to a range of 358 colors and the flexible super-brush nib. Ciao Markers also have the super-brush nib, but they only come in 180 colors. The unique brush nibs make it easy to blend colors, so whenever possible, I reach for either a Ciao or Sketch marker. Begin with the lightest color, the Y11. Color with the side of the brush, in a circular pattern, evenly soaking the paper. When done, your circle should look nice and smooth with a single, flat color. Next, I use the side of the brush and "flick" in the darker Y15 shadow along one edge. The flicking motion lays more ink where you first touch the pen down and less ink as you lift up. This takes practice, but will help you achieve smoother blends. Then, with the side of the brush, I come back with the Y11 and again color in a circular motion. I color heaviest where the two colors meet. I try to leave the darkest area alone. Notice the whole smile gets a shade darker? This is from the second layer of Y11. Last I come in with the Y38 and add another layer of dark. Then, I blend that back with the Y15, and if needed, blend that with the Y11. In summary, start light, add darker colors, and always blend with the lighter marker. I try to keep a good range of contrast, so you can easily tell which side is light and which side is shadow. If you over-blend then your smile will look flat. 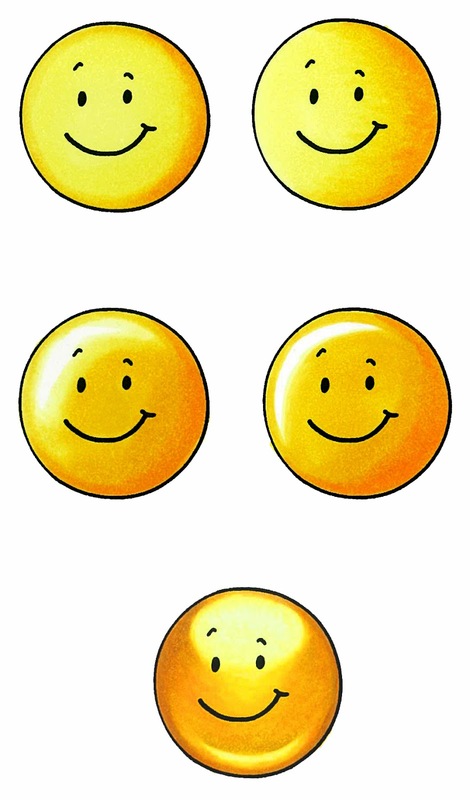 Compare the 4th face to the third one. The added contrast makes the whole smile seem more dimensional. If you over-blend and lose the contrast, then go back and layer it in again. This makes the picture more interesting. Do you have to color a smile just like the one above? No. Here are some variations. Compare the top pair of faces in this image. Both use the same colors, but on the first one, I made the blend much tighter. You might prefer this look. Contrast makes things look shiny. On this second set of faces, I used hardly any Y11, and a lot more Y15. The main difference is that I left a strong highlight of the white of the paper. The first face has a softer highlight, the second face has a much sharper highlight. Again, you can choose which you prefer. But, compared to the first two faces, these look shiny. The last one in this set I tried to color like a marble or as if it were slightly transparent. Light goes in through the top highlight area, then passes through the yellow ball, exiting along the bottom edge. I darkened the deepest yellows on this face with a layer of E33, as this makes the yellow less intense. Try coloring something as simple as a circle and see how you can make it look more rounded or like a ball. If you want it to really look like a ball, it helps if you throw in a simple cast shadow. On this last sample, I added a circular shadow to match the ball. I blended N1 and N4 into the shadow. Notice the shadow is darker closer to the ball, and lighter as it get farther away. This is because up close to an object more light is blocked in a shadow, so it looks darker. I hope this gives you a few ideas for coloring rounded objects. I encourage you to experiment with different looks until you find ones you like. Just a reminder, on Thursday I will be participating in a free demo at the U of O Bookstore from 10am-4pm in Eugene, OR. Come see me color and ask questions. 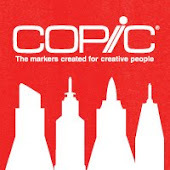 February is always a busy month for me, here at Copic. I have a lot of local demos and events that I will be participating in, so look over the list carefully, and hopefully, if you are in my area, you can attend one of my events! 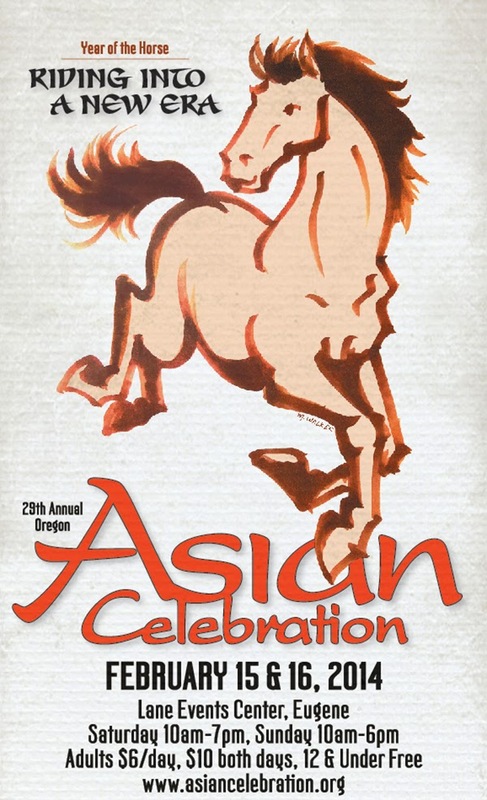 As with past years, I had the honor of illustrating this year's Oregon Asian Celebration poster. This is the year of the horse, so I carefully researched traditional Chinese brush paintings of running horses. After working with the Celebration Committee, we decided on this pose. I drew the horse with an E37 Sketch marker, on a piece of 11 x 17 paper, using large, bold strokes. It was colored and composited on the computer. Saturday from about 2:30-4p volunteers will be working the tables. Sunday from about 2:30 to 4pm I will be demoing, answering questions, and drawing for people that stop by. The reason I won't be at the Asian Celebration on Saturday is because I will be teaching Tracing Memories classes up in Portland. Two sessions to choose from. 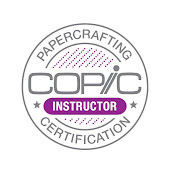 These are comprehensive, in-depth workshops designed to take a beginner through all the steps needed to choose colors, blend, add finishing touches, and convert your own photographs into outline works of art. Portland, OR Saturday, 9am to 1pm, or 2pm to 6pm, $99 either session. 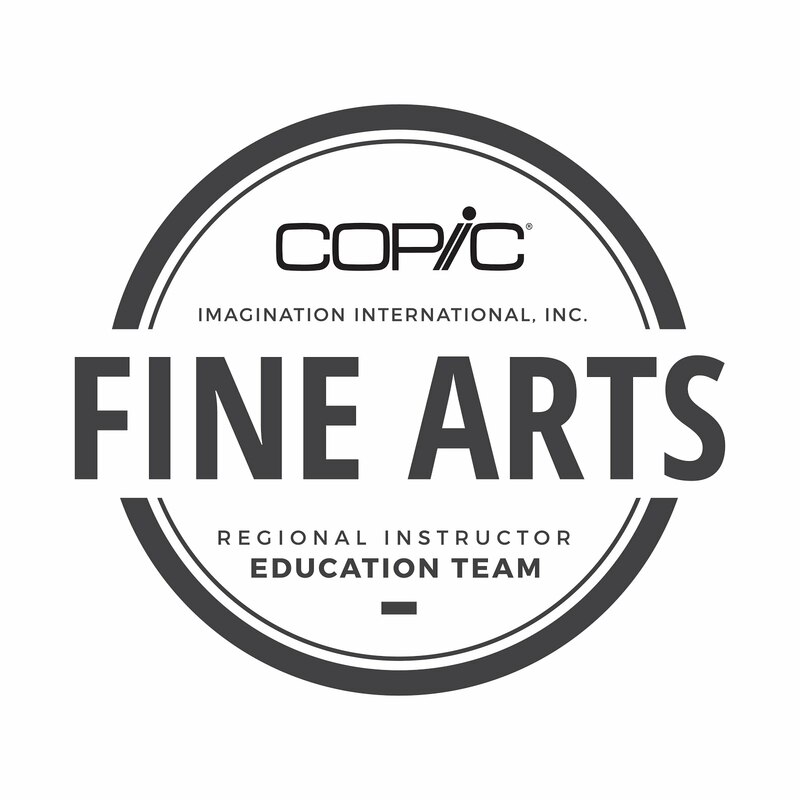 If you live in the Eugene area, Copic is sponsoring some low-key dinner coloring sessions, in conjunction with Sheldon Park Assisted Living. 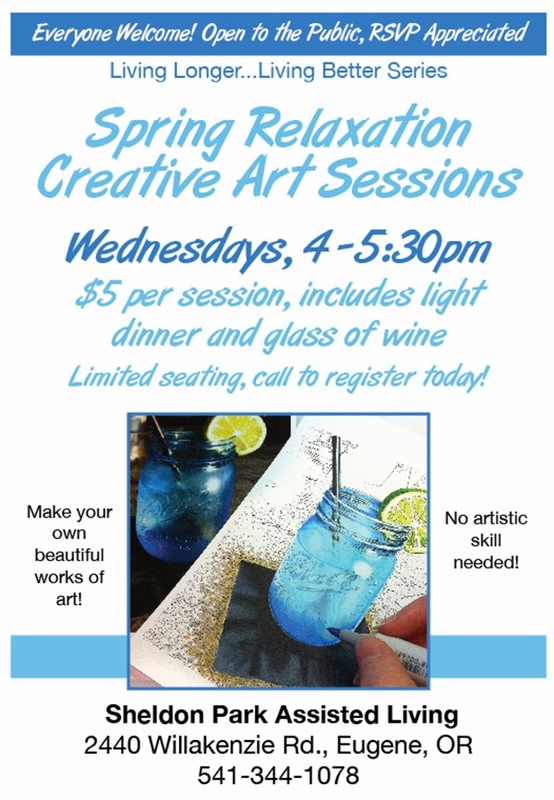 Starting Feb 19th, and running through April 9th, you can come for an evening and participate in one of our "relaxation sessions." Includes light dinner and glass of wine. Most weeks, I will be there, unless I am out of town. These are not comprehensive classes like my 4 hr. workshops. Rather, these are intended for people to try Tracing Memories and color a single picture in a relaxed environment, using our supplies. Great for beginners, friends, and family. Want a chance to stop in and ask me questions, see me work, and look at my example books? On Feb. 27th I will be demoing at the U of O annual Proudly Oregon event. This is free, open to the public, and a great chance to meet Oregon businesses, see Oregon artists, and try some great Oregon foods and beers. I will downstairs in the art department, happily coloring away (What better way to spend my birthday?!). Come and see what I will be creating and enter to win a neat doorprize. Thursday, Feb. 27th, Eugene, OR 10 am until 4 pm, Free! Whew, that's a lot of fun venues around Oregon this month. I hope to see you at one of them!